As a child, Dr Philip Chou’s (Dentist) first encounter with the dentist was due to a painful toothache. Because of the experience, he developed a fear until one day he visited a dentist that changed the way he felt about the oral health experience. After having his smile own rehabilitated and free of decay, Dr Chou developed a passion and empathy that led him to pursue an education in dentistry. In 2007, he earned his Specialist of Dental Science degree from the University of Queensland. Following graduation, he joined a family dental practice in Brisbane’s bayside where he enjoyed having the opportunity to make a difference in other people’s lives. Dr Chou was able to instill that oral health care could actually be a pleasant experience for the patient. I’m most rewarded when I’ve made a difference in someone’s life and transformed the way they feel about their smile. As a father himself, Dr Chou believes that children should experience dental care in a way that is non-confrontational and easy to enjoy. He strives to equip parents and families with the information that they need to ensure a lifetime of healthy smiles for their sons and daughters. Read about Dr Chou on the Whitecoat dentist review website. With a decade of experience under his belt, Dr Chou was presented with the opportunity to open his own private practice. 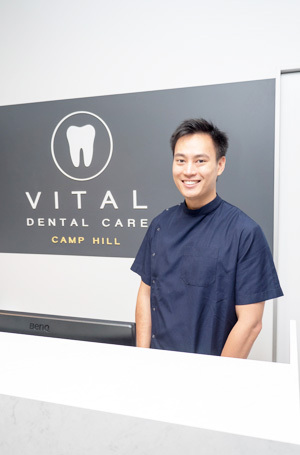 At Vital Dental Care in Camp Hill, Dr Chou and his friendly, experienced team strive to continue the same mission of state-of-the-art care, in a modern clinical setting. When he isn’t busy being a dentist, Dr Chou enjoys traveling and trying new foods. He and his wife spend most of their time with their young daughter.